I have decided to start selling a Limited Commercial License for my pencil shaped pouch tutorial. This is a license to make and sell handmade items using the Gwenny Penny pencil pouch tutorial. 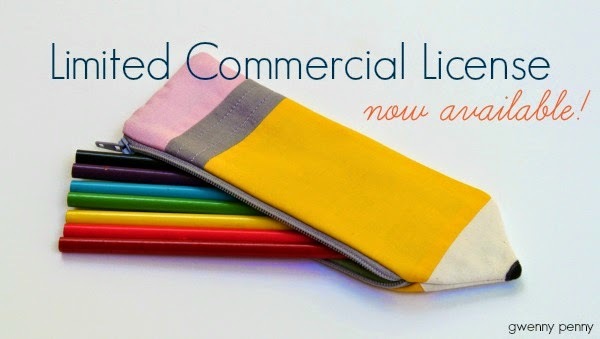 If you have a home sewing business and purchase this license, you are entitled to make and sell these pouches for profit. The license is good for as many pencil pouches as you are capable of making by hand, and all items must be handmade by the purchaser. Factory or mass production is strictly prohibited. The fee for the license is $10. I am asking sellers to agree to follow a few specific guidelines. If you are interested, please read the complete terms and conditions, found HERE. There you will also find a link to pay for the license and a form to register your business with me as a licensed seller. This is a great back-to-school item and my most popular tutorial. I love providing my free tutorials here on my blog for personal use (which includes making items as gifts), but I have spent a lot of time working on my tutorials, and I feel the license is the best way to be fair in regards to profiting from my design. I want to thank everyone who has already expressed an interest in purchasing the license. I really appreciate it! Please let me know if you have any questions.